In which I proved I can still finish on top of the pack…for now! We had x at Bunratty 2019, which was another bumper 350-player festival, and although we didn’t take home any money for the first time in quite a while, there were still some very solid ratings gains on offer. In the Minor, a last-round draw with the top seed denied Yubo a share of third place; he’s now at the stage where it’s going to be an annoying struggle to get out of the U1200 section, as his 4½/6 only saw him gain 18 points. Behind him, Venkat started slowly but ended with two Sunday wins for 4/6, while Lorcan‘s 3/6 saw him drop 30 points and Felipe‘s 1½/6 was an improvement on Gonzaga and St Andrew’s. But most of our players, for once, were in the Majors or the Challengers. Lara and William were the forerunners in the Major; Lara got 4/6, losing her final round – as black! – which denied her a share of second at her opponent’s expense, while William got to 2½/3 before being scuppered by an 1199 who ended with a 1700 performance. This was all the more surprising given he had a 24 K-factor; with a 40 K-factor, he would have gained 270 points, and William, who took a bye in round 6, would have been up, not down, points. Elsewhere, Felix recovered from a bad start to win three on the trot before falling victim to the same player who beat Lara in the last round, and then had a tough draw in the last round against the unbeaten Rafael Renji, from which he took a draw. Finn lost to three players rated 150+ points higher and beat three players 150+ points lower to pretty much break even – this included losing to Lara and Slavko in the first two rounds in what were relatively rare examples of derbies over the weekend. Slavko also ended on 3, as did Thomas, who of course lost to Patrick Brozynski, but still ended the weekend up 40 points. Zhengjun had a bit of a disaster though in his first tournament since gaining 200 points at Gonzaga – his 1239 performance would have been ok a month ago, but this time around it saw him lose 80 points! Still, it’s far from uncommon to lose points straight after a huge gain, and you just have to trust that your strength is increasing when your rating is taking a battering! Leon and Dylan scored 2½; the former after starting with 2½/4, and the latter after taking a final round bye; Dylan was also involved in the only derby in the section, when he beat Brendan, who scored three 1700+ draws before, as you do, losing his final round match against a player who ended up with a 1570 rating. The unexpected star performance came from Odhrán, who only lost once all weekend and ended on 3½ for a 110 point gain. That one defeat did come against a player who had fallen asleep mid-match – Odhrán’s games are never particularly wild, but they’re rarely that dull… After some agonising as to what to do about an opponent who had her head on her hands by the board on her own move, the controller eventually gave her a nudge, and she woke up and played out a win – and suitably refreshed, went on to win her other two Saturday games as well. I did manage to pip Odhrán on tie-break in the final rankings, though it could have been better as I missed two wins against 1900s. The first played what I assumed was a pet – if obscure – line of the Scandinavian, but it was in fact complete nonsense and I missed the chance to win a piece as early as move 8, while in the second game, I agreed a draw in a position Fritz gave as +6, with the winning plan being to run my king into space; I had missed that not only did my opponent not have an attack, but his bishop was also trapped and lost. In between, I had a 14-move defeat where I simply played my 9th and 10th move in the wrong order; my opponent said he had picked up the opening – the h3-g4 line against the Dutch – from a player he had played a couple of years ago called Brendan Cooney… But I finished off with a nice win against Jack Short; I’ve now played Jack five times, and each time white has won (and in fact, in my six games against Shorts in general, white has always won). In this position, black has just played 17. … Bb7-d5, intending to meet 18. Qh3 with Rd8 and hiding the king on f8. How did white, to play, refute that plan? After 18. 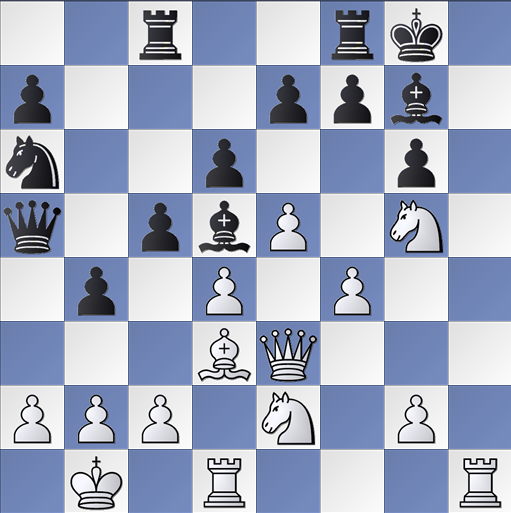 Rh8+!, black resigned – mate is unavoidable, despite the fact that black has a brief king hunt. 18. … KxR 19. Qh3+ and mate next move is trivial, but 18. … BxR 19. Qh3 is also mate after 19. … QxP+ 20. Kc1 Qa1+ 21. Kd2 Rd8 22. Qh7+ Kf8 23. QxB#. A nice way to end a weekend which saw me gain 30 points and reach a new high of 1731. ← Charity blitz this month!